This accessible volume is a resource to better one's decision-making of which strategy to take to maximize return on inventiveness. The value of Slusky's work are (in no particular order of relative importance) 1. to determine what questions a good patent agent or attorney would ask you of your embodiment, and ask those questions of yourself 2. the extent to which you wish to use the identification of problems in your specs in the construction of your claims 3. to determine the extent you wish to rely upon dependent claims should your main claims prove to be unpatentable during prosecution, or invalid after patent issuance, which is becoming increasingly common and 4. determine the timelines and fields you wish to work in. The importance of point one is to understand an agent or attorney's necessity of showing non-obviousness of attempt after the KSR decision - the standard of non-obviousness is now "obvious to try". It is beneficial to try to find the alternate embodiments that the agent or attorney might see before bringing it to that individual for patent filing. Certainly the examiner will not care about inventorship, because the declaration is essentially an affidavit, but the BPAI will, and so will the agent or attorney who can litigate a claim of co-inventorship at a later date. For those who consider this overly cautious and unlikely, consider that your portion of the claim (whether the agent or attorney is declared as a co-inventor or not) can be disallowed, but not the agent or attorney's portion. The contributor to the field then becomes the guy you hired, not you. With highly unpredictable examiner decisions, and BPAI and court rulings operating under non-objective law and considering the number of overturned and invalidated patents at the present time, this is an important and prudent consideration. The importance of point two is that those who seek to file a claim against you are currently using the problem-solution identified in the specs and arguing for "obvious to try" (one simply recombines known solutions). It is important to weigh the problem-solution approach against the claim approach when drafting to choose the best one, even though identifying the problem-solution and related steps as per Slusky's exhortations is an important process. Whether your "obvious to try" patent is still valid after patent issuance is a highly inconsistent ruling within and across all fields. The BPAI and actual courts have granted legitimacy to many non-objective notions, and the cost of defending and prosecuting one's intellectual property brings me to my third point. 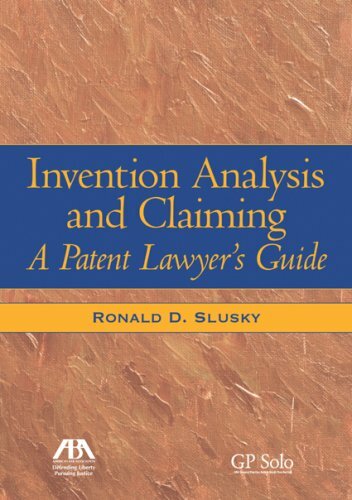 Slusky extensively discusses dependent claims and the "planned retreat" strategy to give up as little intellectual property as possible by creating narrow scopes for prosecution, and to establish a defensible position for the remaining property should the main claims be unpatentable or invalid. Each individual or company can, by reading this book, determine one's litigious character prior to seeking a patent, no matter how likely a market will demand one's creation, or aspects of one's creation. The time and monetary expenses associated with one's litigious character should be anticipated and planned for by every inventor, even if one relies upon angel investors or works freelance through InnoCentive or Tynax, and even if one’s creation is not biotech or high tech. The necessity of doing so underscores the value of this book. Lastly and from a cost perspective, the organization of the chapters helps you to systematically consider and finalize the timeframe you wish to devote to patenting in one field or niche before moving to another, and whether you wish to profit (and take on risks) sequentially or whether it would be more cost- and time-effective to patent concurrently in different fields/niches. For each patent you wish to file, the chapters also help you communicate effectively with the agent or attorney to minimize fees for these communications. Up to a certain point, the person you hire can only be as good as what you tell him to do. The book also helps you create your criteria to analyze the experience and skill level of the agent or attorney, so that the person you hire can be the expert you need in specific areas in which you can't tell him what to do. I also appreciate that Slusky uses common manufactured items such as the double-hung window and the touchtone telephone to illustrate his points rather than referring to software or genetic patents. While not the only work I have read on the subject, it is certainly the most helpful I have come across so far for the purpose of interfacing with the USPTO of the present day. Many parts of the book can be previewed on Google Books, but I have made it one of the few books I actually own. I also suggest those interested read Slusky’s columns in iptoday.com. As a patent holder (Multi-vendor internet commerce system for e-commerce applications and methods therefor - Patent Number: 7,197,475 - Issued: March 27, 2007), I'm curious what the Forum members think about business/process patents. I'm ambivalent about them - but that's easy for me to say since I hold one. I'm curious what the Forum members think about business/process patents. I'm ambivalent about them - but that's easy for me to say since I hold one. I'm not clear about what a business/process patent is. Could you give some examples? The current USPTO instructions to examiners say there is no difference between thinking up a business method and an actual, physical technological invention. Never mind if the business method works, as long as it is novel, says the USPTO. But the requirement of usefulness is lost since the failure of the business securing that patent does not invalidate the patent. Since that requirement is labile as Jell-O, then the current rules (from the State Street Bank decision forward) should allow for patentability of obvious method solutions to non-obvious problems as well. Method patents should be examined on a case-by-case basis rather than dismissed outright since there are proper patents of method. For example, suppose I were to start a middleman business that transports cut flowers from greenhouses to florists, but the flowers are of a particular sort; they are all self-regulated in their temperature in relation to ambient temperature. This organic modification extends the life of the cut flowers and reduces costs of transport and costs of florist/recipient storage since refrigeration external to the flowers is nice to have, but not required. If a normal transport vehicle is technologically altered to maximize the weight of transported goods now that refrigeration is irrelevant, that method of transport is a novel solution of industrial utility. They are patents for ideas as opposed to things you can hold in your hand. My patent, for example, is for the concept of a multi-merchant ecommerce shopping cart. My patent doesn't rely on actually building the shopping cart. If someone else creates a shopping cart that conceptually matches my patent, he is liable. My patent, for example, is for the concept of a multi-merchant ecommerce shopping cart. Has anybody licensed the patent? If so, have you gotten a significant return from it? The patent is owned by the company I work for, SHOP.COM. As we are a private company, I can't comment on how we've used the patent. They are patents for ideas as opposed to things you can hold in your hand. No, they are not. The only PTO that issues patents for ideas is thankfully only on Tlön. I gave the specific example I did precisely because the transportation of the cut flowers can be claimed in terms of its actual physical parts as well as the process, using as many of the statutory classes of patentable matter as possible. The examples in my response to Betsy's question were included "things you can hold in your hand". My patent, for example, is for the concept of a multi-merchant ecommerce shopping cart. My patent doesn't rely on actually building the shopping cart. If someone else creates a shopping cart that conceptually matches my patent, he is liable. I do not know if this is your actual understanding of your patent, the patent process and what rights you get, or if this is just a loose summary. Your patent was not for the non-physical concept, but for a process which results in a useful, tangible, concrete result - a transformation of merchants' inventory from one state to another. What you are saying is that diagrams of your idea sufficed to make it patentable, and that this is what distinguishes (all) method patents from other patents. This loose use of words in the field of patents makes your statement untrue. Also, I do not know what you were told about the likelihood of demonstrating infringement at the time of filing, but as of last year, I believe you'd have to show that there's a connection between an accused infringer and multiple individuals' performance of necessary shopping cart steps to prosecute successfully. Remember that a right is a moral sanction of freedom of action. A political right is government acknowledgement and enforcement of that. Freedom of action must be in the physical world. All property rights, including intellectual property rights, must therefore pertain to the results and implications of your thoughts in physical reality. That does not rule out, and in fact requires, the role of your mind in producing something worthy of a patent.